Cristiano Ronaldo will not be in Real Madrid's starting lineup for the Copa del Rey final against Barcelona. More than one shadow hangs over Wednesday’s Clasico Copa del Rey final between Barcelona and Real Madrid. The teams’ last meeting in a final, in 2011, was won by Cristiano Ronaldo’s towering extra-time header. But Madrid’s superstar Ronaldo is definitely out of this year’s decider, with the Portuguese attacker suffering from both knee and thigh injuries. 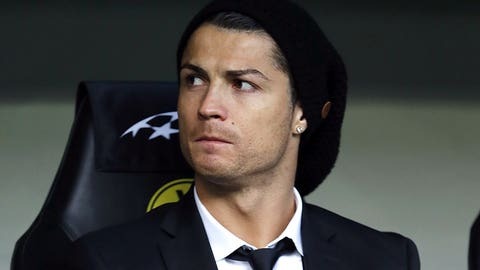 "Cristiano is not available to play," Real manager Carlo Ancelotti said Tuesday. "We do not want to take risks as we have other important games this season. [But] we have played very well in games he’s missed, worked more, and ran more. I am sure we have prepared very well and are going to play very well tomorrow." Ronaldo’s absence shifts attention to fellow ‘galactico’ Gareth Bale. Having put all injury concerns behind him, the Wales winger is now up to 18 goals [and 16 assists] in his first 34 Madrid games, and was signed for $130 million last summer just for games like this. Ancelotti’s biggest call is whether to play the attack-minded Isco in midfield, or perhaps the more defensively secure Asier Illarramendi. Center-back Sergio Ramos missed the weekend’s 4-0 La Liga win over Almeria with a shoulder muscle injury, but looks to have recovered in time. Iker Casillas, who could be the first goalkeeper ever to win the competition without conceding even once, is sure to start. The Madrid club captain said he was hoping for a similar result to three years ago – when a Madrid team managed by Jose Mourinho scrapped its way to victory amid that spring’s memorable ‘storm of clasicos’ against Pep Guardiola’s Barca. • Goal: Is Real losing its Spanish identity? • Does Bale dislike playing for Real Madrid? "I remember that final as a good game, full of passion," Casillas said. "I would not change anything. The team played a great final and we all want to repeat that. We know it will be not easy, but we are confident we can win the cup." Confidence is not so high in Catalonia, where Barcelona coach Gerardo Martino is being pilloried after last week’s Champions League exit to Atletico Madrid was followed by a 1-0 defeat at Granada on Saturday that saw the team slip to third spot in La Liga. Barca midfielder Andres Iniesta accepted at Tuesday’s media that some criticism was fair, but reminded reporters gathering that his side — which won everything under Guardiola, but now seems on the slide — could still rise to the big occasion. 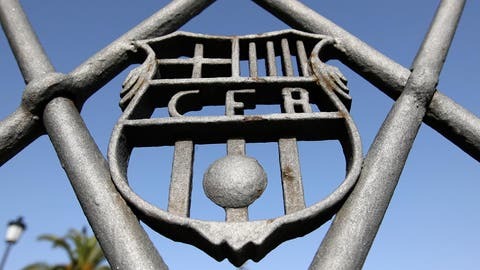 "Many times this team, these players, have done very well against big teams in finals, in key moments," Iniesta said. "We are the first to be self-critical when we make mistakes. Everything does not always go perfectly, but you get up and suffer and continue. We must think about what is left for us to win, and go for it." While Barca have scored only five goals in their last five games, three of those from penalties, its biggest pre-game issue is at the back. Reserve goalkeeper Jose Manuel Pinto has looked shaky recently, while Carles Puyol, Gerard Pique and Marc Bartra – the squad’s only three center-halves – are all less than 100 per cent fit. • Holy trinity! Messi, Neymar, Suarez best ever? Cesc Fabregas is also under pressure after a dip in form, so either Alexis Sanchez or Pedro Rodriguez could come in. And incredibly for most, even blaugrana talisman Lionel Messi has faced some brickbats from his own side’s fans over the last week. On Tuesday Martino defended his countryman - who only last month scored three times in a 4-3 La Liga win in Madrid. "Messi is still the best player in the world," Martino said. "You must be very brave and very honest with football to do what he does year after year. It is unfair for people to make judgments based on one or two games." Special supporters trains are also running from Madrid and Barcelona to the host city, and designated ‘fans’ zones’ for each side set up by the river Turia. 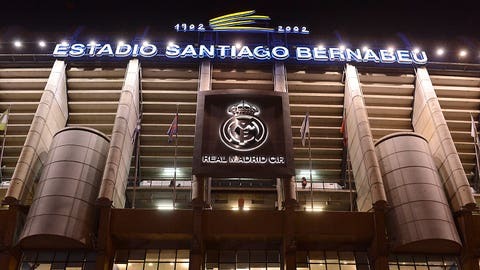 20,000 fans from each side have secured seats for the 55,000 capacity Mestalla stadium, and while the Copa may be behind La Liga and the Champions League in terms of prestige, tickets reportedly selling for more than $3,000 on the black market tell its own story. Respective club presidents Florentino Perez [Madrid] and Josep Maria Bartomeu [Barcelona] have made personal visits to training this week to gee up their teams. At kick-off they will be in Mestalla’s plushest seats, along with the man who afterwards hands out the trophy named in his honour – Spain’s King Juan Carlos I. Also sitting watching will be Ronaldo, while Messi will be out on the pitch, with a chance to make his critics eat their words. That could be enough to tilt the trophy Barca’s way.